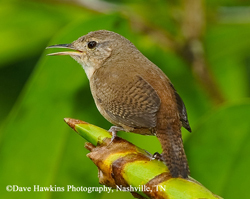 The House Wren is a common backyard bird in most of the U.S. and parts of Tennessee. Like other wrens, it is attracted to human development, with the numerous nooks and crannies provided by barns, garages and other structures. Though very small birds, the House Wren is a fierce competitor for nest cavities, sometimes dragging eggs and young of other species out of a nest, and even killing adults. In some areas, it is a main source of nest failure for Bluebirds. However, it is a native bird that is protected by law. A small and compact wren with a flat head and long, curved beak. It has short wings and a relatively long tail that it often keeps cocked above the body. Both sexes are dull brown overall with darker brown barring on wings and tail. Very pale eyebrow compared to other wrens. The House Wren is found in open woodlands, forest edges, and urban and suburban parks, backyards and farmyards. It is particularly attracted to areas with scattered trees, shrubs and brushy tangles. This species forages through thickets and shrubs for insects and spiders. Also eats flying insects, such as leafhoppers and flies. In early spring the male House Wren starts building nests to persuade a female to mate with him. He piles twigs into an old woodpecker hole, natural crevice or other cavity to serve as a base for a soft-lined cup made of a few feathers and grasses. The twigs are often mounded up into a barrier between the nest and cavity hole, providing protection from weather and/or predators. Incubation period: 9-16 days. The nestlings are fed by both parents and fledge in 15-17 days. May have more than one brood per season. Song: The song is an exuberant jumble of bubbling trills and rattles. They sing from early spring into mid-summer. As with other bird species, blood-sucking nest parasites can infest a nest and be a problem for the developing nestlings. Some House Wrens have been found to put the egg cases of predatory spiders into the nest material. In a recent laboratory study, when the spiders hatched they fed on the nest parasites and likely improved the health of the nestlings. Preferred box design for House Wrens is slightly smaller than the NABS Eastern Bluebird box with a 1 ¼ inch entrance hole. This box design may also be used by Carolina Chickadees, White-breasted Nuthatches, Tufted Titmice, and Prothonotary Warblers. To attract House Wrens, place your box in a more wooded area than recommended for Eastern Bluebirds. Place the box near woods, shrubs, and thickets, which are used for foraging and hiding from predators. Farms or barnyards where animals are fed are not recommended sites for boxes because these are attractive to House Sparrows. Avoid placing your box where pesticides or herbicides are used. Mount the box so that the entrance hole is about 5 ft. from the ground and facing, if possible, to the east, away from direct summer afternoon sun and from north winds that may drive rain into the box. A tree or shrub that is within 100 feet of the box will provide a perch for the adults and a safe spot to land for the fledglings' first flight. If you plan to put up multiple boxes in an area, we recommend placing boxes at least 100 yards apart to reduce competition between House Wrens and other species. To prevent doing more harm than good, do not install a box if you do not plan to monitor it. Check the box once a week during the nesting season to monitor status of House Wrens or other native nesting species, check for leaks and damage on the box, and provide you with a wonderful education. Keep in mind that even the perfectly built and placed box may not attract a breeding pair the first year. If after two years of not having native birds nesting in your box, you may want to move it to another site.